I used to have an obsession with photo groupings... that is, until in our last rental, I went a bit overboard and did a grouping of 20 or so pictures above our dining table- apparantly this is referred to as "excessive damage" by a landlord and eats up your damage deposit! But, if you own or have a chill landlord, here's a surefire way to hang one- or many- picutres without any slip-ups! 1) Compile all pictures that will be in your grouping and flip them over, so that the image side is face down. 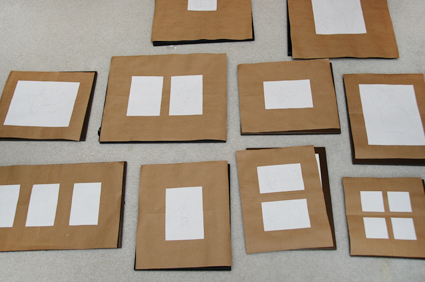 On some butcher or scrap paper, trace the outline of all pictures and cut out the shape. 2) Place the cut-out template directly over the picture and mark an "X" over the mounting hole on the back of the frame. 3) Use sticky tack or painter's tape to attach the picture templates all over the wall. Try a whole assortment of arrangements- and don't feel limited to the first arrangement you try!- true art can take some time. Tip: Leave at least an inch and a half between all sides between mounted images. It will give some breathing room between pictures. If you are working with a large wall area, increase the space between pictures. 4) Use picture hanging hardware and nail the directly over the "X" you marked. 5) Remove the template and hang the picture! Voila! Wasn't that easy!? When doing a photo grouping, the rule of thumb generally is to use a single frame color... I beg to differ. In my last grouping, I used mostly black frames with punches of pink, white, and green frames. It was a bit chaotic, but I loved it! hint: once pictures are hung, it can be impossible to keep them straight! For all those OCD-picture-hanging-types, add a 1/4" wide strip of double-sided velcro to the bottom corners of the pictures to keep things straight and orderly!